- Adjusts the white balance separately for the main subject and the background when the flash fires. - Differs according to zoom position. *5 Actual frame rate is 23.976 fps. *When in High-speed Burst or Low Light. *2 When images have been selected in image search, only those images will be erased. 4.95 oz. / 130g (camera only)Note: 30 display languages provided (English, German, French, Dutch, Danish, Finnish, Italian, Norwegian, Swedish, Spanish, Simplified/Traditional Chinese, Japanese, Russian, Portuguese, Korean, Greek, Polish, Czech, Hungarian, Turkish, Thai, Arabic, Romanian, Ukrainian, Farsi, Malaysian, Indonesian, and Vietnamese). With built-in WiFi technology, it's easier than ever to share captured images and HD videos with friends and family. Compatible with WiFi® (802.11 b/g/n wireless standard), this camera can connect with compatible home networks or to wireless access points. You can easily share your images and videos by signing up on CANON iMAGE GATEWAY* - an online service that lets you store images to an online album, and share your images on Facebook, Twitter, and YouTube. Upload images virtually anywhere, via your iPhone®, iPad®, or iPod touch® mobile devices by installing the free Canon CameraWindow app (the Android app is under development). Step-by-step instructions for connecting your PowerShot to your iPhone®, iPad® or iPod Touch®, using a wireless or 3G/4G network. Find out how to send images from your Wi-Fi® PowerShot to a friend's Wi-Fi® PowerShot! 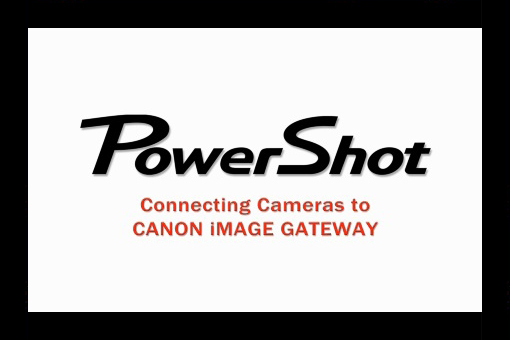 Configure your camera to post your images and videos online and more when you set up a free CANON iMAGE GATEWAY account. Transfer images from your PowerShot camera to your Android device with a few easy steps.